The Similar Genome Finder Service will find similar public genomes in PATRIC or compute genome distance estimation using Mash/MinHash. It returns a set of genomes matching the specified similarity criteria. The Similar Genome Finder submenu option under the Services main menu (Genomics category) opens the Similar Genome Finder input form (shown below). Alternate option for uploading a FASTA file to use as the basis of comparison. Note: You must be logged into PATRIC to use this option. Max Hits: The maximum number of matching genomes to return. P-Value Threshold: Sets the maximum allowable p-value associated with the Mash Jaccard estimate used in calculating the distance. Distance: Mash distance, which estimates the rate of sequence mutation under as simple evolutionary model using k-mers. 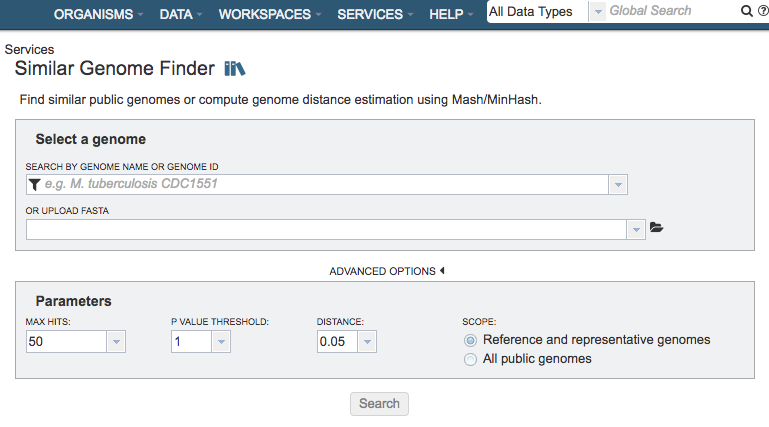 The Distance parameter sets the maximum Mash distance to include in the Similar Genome Finder Service results. Mash distances are probabilistic estimates associated with p-values. Scope: Option for limiting the search to only Reference and Representative genomes, or all genomes in PATRIC. Search: Launches the similar genome finder job.